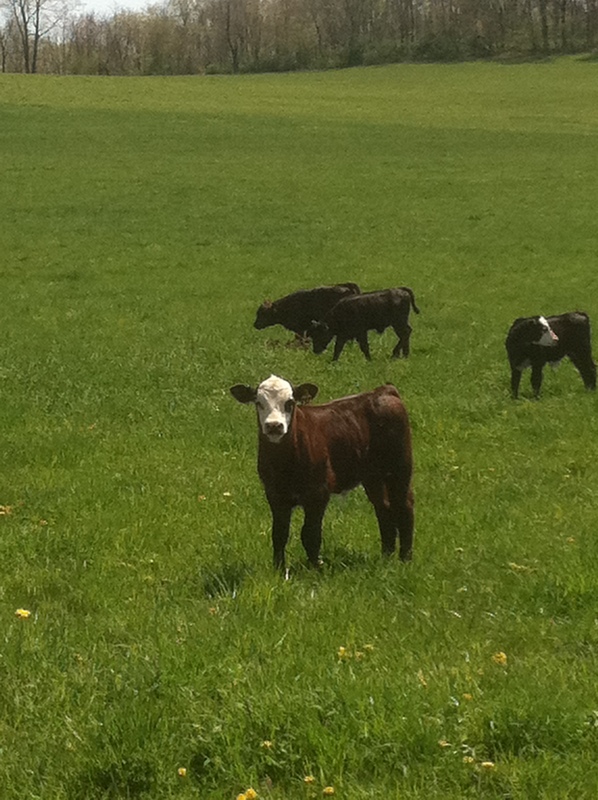 Our Angus cattle are on grass…all the time. 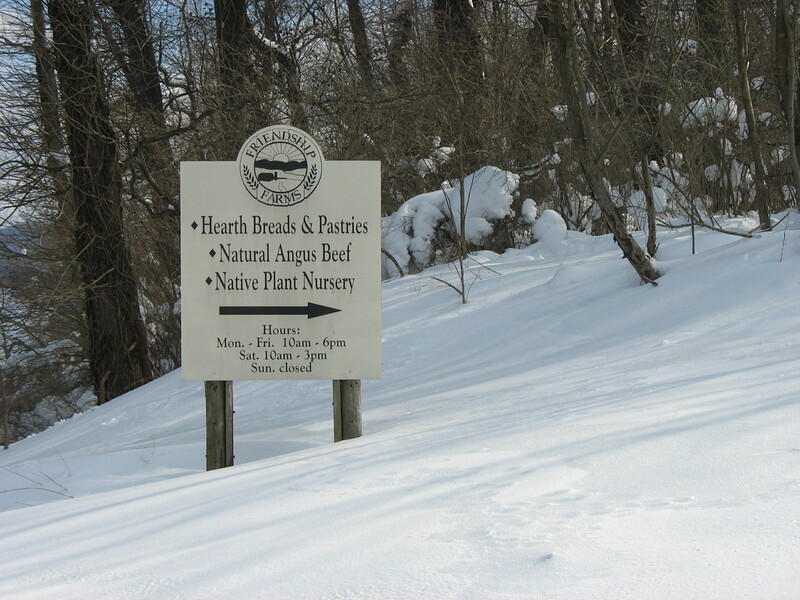 Friendship Farm’s angus beef is known for its flavor, tenderness and wholesome qualities. Customers can also be assured that the cattle were raised in a humane, environmentally sensitive manner. 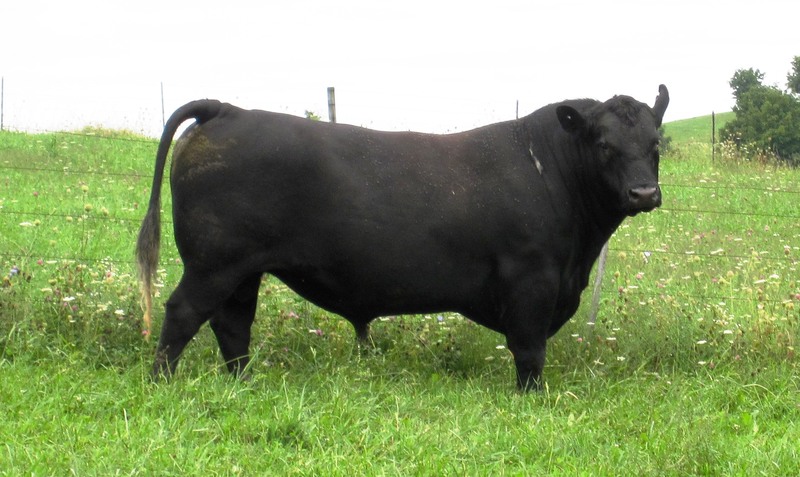 The Costello family has raised cattle since the mid 1960’s. The cow herd is home-grown, developed by using bulls that were selected from among the best purebred Angus herds in the country. All of the calves sold for beef are born on the farm and live their entire lives on pasture. They graze on orchard and rye grass, timothy, clover and alfalfa. During the warmer months of spring, summer and fall the cattle are moved from pasture to pasture using temporary fencing. In the winter months, they are fed hay made from these same fields. Pastures are fertilized with natural sources and, to avoid the use of pesticides and herbicides, weeds and invasive insects are controlled by timely mowing. 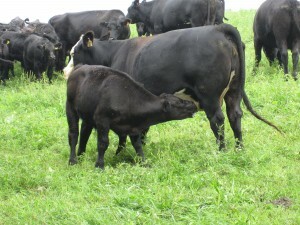 Calf nursing in one of our pastures. The calves at Friendship Farms are never fed antibiotics, digestive supplements or growth hormones. Throughout their lives they enjoy a simple, humane, stress free existence on the farm. The beef is butchered at an USDA approved facility. It is dry aged for three weeks, and is inspected throughout butchering and packaging. The meat is vacuum sealed, labeled and frozen for sale at our farm. It is available for purchase both by the individual cut (for example, steaks, roasts or hamburger) or in bulk as sides (halves) or quarters of beef.